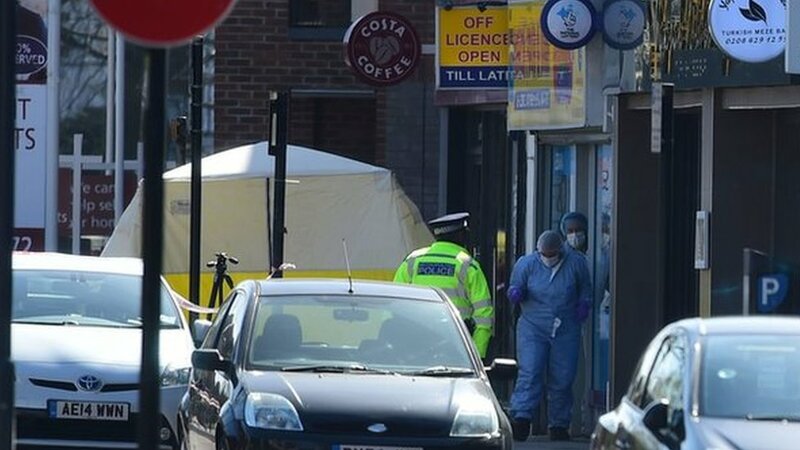 A shop worker has been stabbed to death in a robbery at a newsagents in north-west London. It is believed the 54-year-old was attacked while opening Marsh Food and Wine in Pinner at about 06:00 GMT, the Met Police said. Detectives said the shop’s till had been stolen and may have been dumped somewhere by the robber. The murder has been described as a “tragedy” by locals. No arrests have been made. Police said they wanted to hear from anyone who saw a black Vauxhall Astra being driven away from Marsh Road at speed. He urged anyone who found the till, or saw the car parked in Cecil Park before the attack, to come forward. A large part of Marsh Road is cordoned off and a forensics tent has been set up outside Costa Coffee, next to the newsagents. Local business owner Peter Brook, who lives nearby, said the newsagents’ employees delivered the morning papers to nearby businesses and were “kind, polite and so committed to working in the local community”. Policing minister and Pinner MP Nick Hurd said he was “deeply saddened” by the news. He tweeted that police had increased their presence in the area and were carrying out house-to-house inquires. There have been 29 deaths classed as “homicides” in London this year, including 13 in March.